This Mordan plate below would date to around the 1840s. 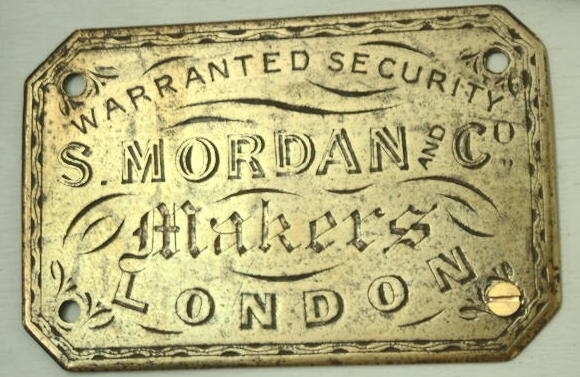 Sampson Mordan made fine quality locks, and no doubt safes also. His locks were styled on those invented by Bramah and copied after the original patent had expired. Around 1830 he also invented a lock protector in the form of a portable escutcheon for travelers to secure their hotel; or inn room doors. His firm made other unrelated inventions, particularly in the development of mechanical pencils and pens. Brass plate 3.4" (8.6cm) x 2.25" (5.7cm). 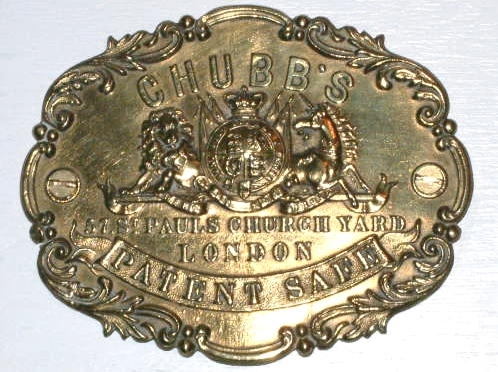 Another Chubb plate likely to date to the 1840/50s. Thick pressed brass plate 4.2" (10.4cm) wide x 3.3" (8.1cm high).